What is 20 degrees C (36 F) warmer than the air temperature, can push through ice in later winter and early spring? What plant behaves like an endothermic animal: it has to burn a lot of energy to regulate that higher temperature? What has a nice shelter that it does not matter if it rains “outside”, it can provide protection for insects? 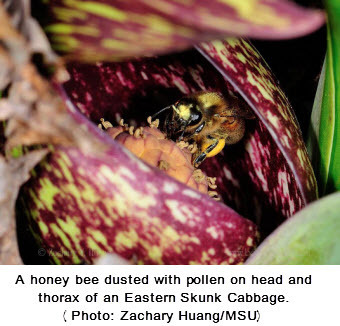 What is so strongly smelly yet provides so much pollen so honey bees will forage on it? What plant has enough calcium oxalate that might give you a kidney stone if you eat one serving of its leaves? It is the Eastern skunk cabbage, Symplocarpus foetidus.